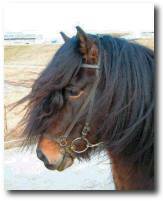 Kalman was a first prize four gaited stallion imported in to the US by Sand Meadow in 2002. Little did we know what a tremendous impact this exceptional horse would have on Icelandic horses in the US - and on us. He was a true superstar inside and out and we were so very lucky to have had him for the 13 years he called Sand Meadow home. The fact that Kalman was first prize says a lot about how exceptional he was as all his other scores had to be extremely high to compensate for his lack of pace. In 2000 when he was just five years old Kalman took 10th place in his age class in the breeding competition at Landsmot (Iceland's national show) which is an excellent result for a four gaited stallion. At age 11 he was evaluated again with even higher scores showing that he still had what it takes. Even at age 20 was still an exceptional riding horse. 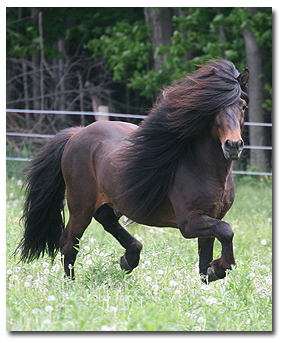 Kalman’s sire Álmur frá Lækjamóti is a very soft and supple five gaited first prize stallion. He was exported from Iceland to Sweden. 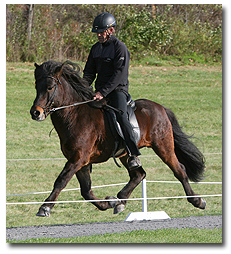 In 1999 Álmur competed for Sweden on the 1999 World Championship team in T2 (tolt on loose rein) tying for fourth place in the A finals and in the Five Gait placing second in the B finals. Kalman’s grandfather on his sire’s side is the famous honor prize stallion Stígandi frá Sauðárkróki. 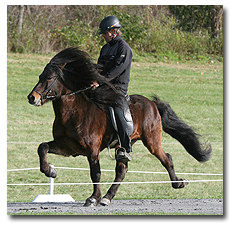 Kalman’s dam, Von frá Stekkjarholti, was an excellent naturally tolting four gaited mare with very high action in all gaits. She proved herself to be a superior breeding horse producing six first prize horses. 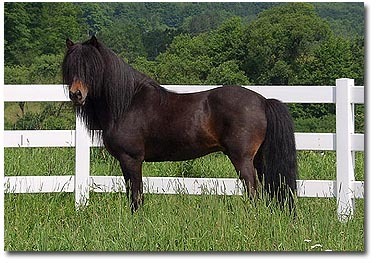 She was a descendant of the famous stallions Ófeigur frá Hvanneyri and Rökkvi frá Dalkoti. Kalman was a pure four gaited horse. He possessed a very natural high action tolt that was easy to get and very smooth to ride. His movements and clear beat in tolt were all 100% natural. He required no special shoeing and was usually ridden on all types of terrain barefoot with no problems. His trot was large, with excellent natural action and suspension. His canter was three beat and he was capable of a beautiful slow collected canter. His walk was exceptional - extremely wide, loose, and ground covering. His gaits were all well defined and easy, even for the novice rider. His gaits were flashy, yet smooth and comfortable to ride for hours out on the trail. Kalman was a stunningly handsome dark bay. He stood out in any crowd. His high scores for conformation reflect that. Not only was his building good, but it was topped off by one of the lushest manes and tails ever seen on an Icelandic horse – given a perfect “10” by the Icelandic judges! 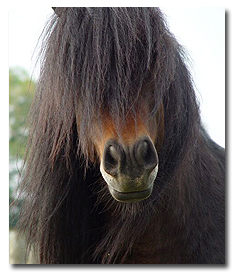 Before we imported him he was known as “the hairiest horse in Iceland” and it’s easy to see why. Kalman was not only beautiful on the outside, but he had the most excellent character. 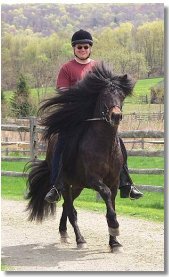 He was a wonderful breed ambassador for the Icelandic horse in the US showing just how sweet and gentle Icelandic stallions can be. 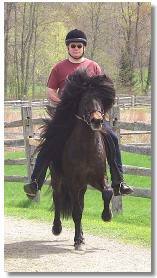 His primary job through the years was as Steve’s pleasure trail horse. He was very calm and easy going to handle in all situations. Under saddle he was willing, obedient and always tried to please. He won ribbons in many disciplines including trail trials and hunter paces. He was proud and confident, yet friendly and affectionate. Simply everything a good Icelandic horse should be. Through his career as a breeding stallion Kalman produced many fine horses that are being enjoyed by their owners out on the track, trail, and in the barn. We feel proud that this magnificent horse was able to further the breeding of high-quality horses in North America. We are sure his bloodlines will be continued by several of his super offspring. Kalman was not only the foundation of breeding at Sand Meadow, but a very special family member. His absence from the farm is felt daily. We are lucky to have known such a spectacular soul. To view many more photos/video of Kalman, please visit his photo album. To view photos/video of Kalman's offspring, please visit their photo album.